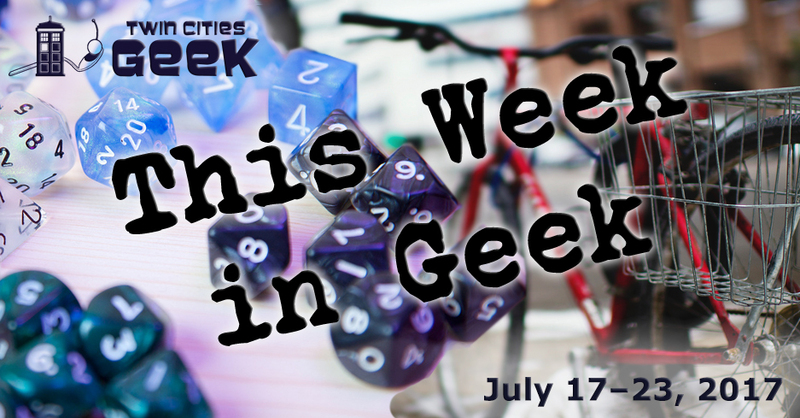 Welcome to This Week in Geek, your guide to events of interest to the Minnesota geek community for the week of Monday, July 17th through Sunday, July 23rd. See 400 different puppet artists come together for a week-long festival of creativity. There will be workshops for puppetry professionals, puppet shows, a parade, and more. You can register is through the website, and day passes are available. When: Monday, July 17th at 6:30 p.m. When: Tuesday, July 18th at 5:00 p.m. When: Tuesday, July 18th at 6:30 p.m. The Geek Partnership Society’s Photography Club meets at the Waterbury Center at 7:00 p.m. on the third Tuesday of each month to discuss topics related to photography and/or participate in photo shoots. This month, the focus will be reviewing the 30-day photography challenge from the club’s May meeting. Hear some catchy tunes and learn how to dance while experiencing the tapestry of Twin Cities culture at 9 Nights of Music. This weekly event begins with dance instruction before leading to musical performances. This week’s performer is Karibuni. When: Tuesday, July 18th at 7:00 p.m.
Come and experience YogaQuest, a blend of yoga and fanfiction storytelling led by certified yoga instructors. Experience a yoga workout experience and a story at the same time. This week’s theme is Firefly, so get yourself ready for the ‘verse. When: Wednesday, July 19th; Thursday, July 20th; and Friday, July 21st at 6:00 p.m. This three-day art course gives teens a chance to learn what it takes to bring monsters to life, from the seed of an idea to a fully conceived creation that might show up on screen or on the page. The class will be led by Jordain Cheng-Kinnander, a local fantasy and concept-artillustrator. Registration is $55, and basic drawing or illustration experience is recommended. When: Wednesday, July 19th at 7:00 p.m.
Embark on a voyage of mystery and history aboard the Jonathan Padelford, a riverboat on the Mississippi. Cruise down the river while doing your part to solve a mystery, taking in the sights, and enjoying a beverage (as amateur sleuths are known to do). This is a great opportunity to learn about the 1920s gangster sanctuary that was St. Paul. Tickets are $18, or $15 for members. When: Wednesday, July 19th at 9:00 p.m. The Minneapolis Park and Recreation Board is presenting movies in various parks throughout the city over the course of the summer, and one of the screenings this week is Raiders of the Lost Ark, the Harrison Ford classic involving stubble, adventure, traps, relics, and danger. This film is presented with English audio and Spanish subtitles. This free showing begins 15 minutes after sundown. When: Thursday, July 20th at 4:00 p.m. The Haunted Basement will be hosting a spooky summer happy hour to raise funds for its infamous Halloween experience at the Soap Factory. A percentage of every pint sold will go to the Haunted Basement, swag will be on offer, and merchandise will be available for purchase. When: Thursday, July 20th at 5:00 p.m. This mobile maker’s marketplace will be at Red River Kitchen, allowing the public to see crafts, enjoy food and beer, and get their bikes checked out for safety. There will be dozens of makers, and this should be a great time to be social. Farmstead Bike Shop, Frank & Ernest Markets & Events, and Minneapolis Craft Market will all be present. When: Thursday, July 20th at 6:00 p.m. This is your opportunity to see the Minnesota Zoo after hours and without children around. Food and beverages will be available and exhibits will be open later than normal, with Discovery Bay staying open until 9:00. Tickets are $10, or free for members. The theme for the Minneapolis Institute of Art’s monthly Third Thursday event for July is Bike Night. The museum invites you to learn about bike safety, play #BikeNightMia Bingo, hit the photo booth, and check out the latest and greatest bike gear. There will be live music from Catbath, eats from the Cafe Racer food truck, and and cold sweets from the Leprechaun’s Dreamcycle. There is a group bike ride ahead of this event, setting out from Surly Brewing at 5:30. When: Thursday, July 20th at 6:30 p.m. When: Thursday, July 20th at 6:30 and 7:30 p.m.
Geek Slink is a bellydance class intended to be a welcoming and safe space to focus on fun, fusion, and fitness. Classes are open to any level of experience, body type, and gender; the 6:30 p.m. is for beginners, and intermediate classes start at 7:30 p.m. Classes are $15 for walk-ins, or 60$ for a 5 class punch card. Free trial classes are available. When: Thursday, July 20th at 7:00 p.m. When: Thursday, July 20th at 7:30 p.m. When: Thursday, July 20th at 9:00 p.m.
Another free outdoor screening this week from the Minneapolis Park and Recreation Board is Pan, a film of swashbuckling fantasy adventure and derring-do. This free showing begins 15 minutes after sundown. When: Friday, July 21st at 6:00 p.m.
Mischief Toy Store in Saint Paul invites you to experience some Magic with them this Friday night. Entry is $5; all players will receive prizes. This weekly event is limited to 24 players and typically lasts until about 9:00 p.m. All skill levels are welcome. Do you have what it takes to save the Federation? Find out at one of Glitch’s four virtual-reality stations in an evening of local multiplayer VR lad by Mark Lacroix. The event will last until 9:00 p.m., and attendees are encouraged to drop in whenever they are able. When: Saturday, July 22nd at 8:30 a.m. When: Saturday, July 22nd at 10:00 a.m. to 1:00 a.m. Enjoy the geeky atmosphere at Byte and take part in a raffle to benefit the Geek Partnership Society. The raffle will take place at 8:30 p.m. and includes prizes like tickets to GPS’s Pirate Cruise, a scimitar, and geeky art from local creators. A portion of all proceeds will go to benefit GPS. When: Saturday, July 22nd at 10:00 a.m.
Where: Northwest Corner of Wabasha St. and Kellogg Blvd. Discover St. Paul’s LGBTQ history on a walking tour led by Steward Van Cleve, the author of Land of 10,000 Loves: A History of Queer Minnesota. This tour includes walking on uneven terrain in the footsteps of greats like Gertrude Stein, Alice B. Toklas, and Oscar Wilde. Tickets are $14, or $11 for members of the Minnesota Historical Society. When: Saturday, July 22nd at 10:30 a.m.
Come to the Bakken and see 3D-printed exoskeletons, motion capture for physical therapy, advanced drone tech, and more. Expect hands-on activities and demonstrations from partners like 3M Visiting Wizards, Magic Arms, Optum Innovation, and Maverick Drone Systems. These activities are included in the $10 price of admission (free for members). When: Saturday, July 22nd at 11:00 a.m. The CW Twin Cities and the Salvation Army partner for a unique opportunity to meet the CW Supergirl lookalike and get your picture taken with her. Coming in cosplay is encouraged but not required. This family-friendly event is a great opportunity to see kites in action, take part in craft demonstrations, hear music, and see a variety of booths from the community. Musical acts include Bob and the Beachcombers, Circus Manduhai, Mariachi Son de Morelos, and convention regulars Harisen Daiko at 1:30. When: Saturday, July 22nd at 1:00 p.m. Celebrate Jane Austen’s life shortly after the bicentennial of her death (July 18) with a movie and discussion at the Sumner Library in Minneapolis. Love and Friendship will be screened, followed by a discussion led by a member of the Jane Austen Society of North America. When: Saturday, July 22nd at 9:00 p.m. Yet another free outdoor screening this week from the Minneapolis Park and Recreation Board is Rogue One: A Star Wars Story, a heist film about the Death Star, ragtag pals, terrifying robots, and capes. This free showing begins 15 minutes after sundown. When: Sunday, July 23rd at 12:00 p.m.
Shieldmaiden Sunday is a dedicated space for female nerds and geeks at Source. This will be a recurring weekly event providing a space for women to play games, chat about comics, cosplay, or just enjoy the company of other geeks.